NintenGen: Crytek thinking about bringing Crysis to Wii? 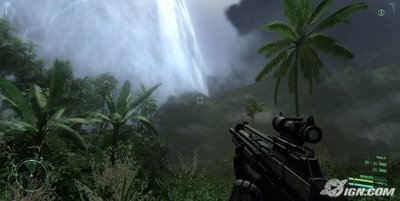 Crytek thinking about bringing Crysis to Wii? GI: It’s assumed that if you do console development it’ll be on the most powerful systems – Xbox 360 and PS3. What do you think of Wii? Yerli: I love the Wii (laughs). When I was at E3 and playtested it, I loved it. I thought about how we could do games for this platform and what kind of games they would be, and what kind of shooters we could do on it, and work it to our own needs here. Yes we’ve had some thoughts, but Crysis is not part of the plan at this stage, but that may change. We are a company that takes one step at a time, and once we achieve the goal that we want to achieve then we take the next step and see what the next platform we go with next. We did not decide if we’ll do PS3 at all. We have all of the development kits, and we have research going on. We have the Wii, Xbox 360, and PS3, we work as researchers and test them, essentially. We have parts of these systems running because there is going to be console development in our company, but if it’s going to be Crysis or not is a step ahead of us. Because if we go to fast we sacrifice quality on PC, and I want to make sure it’s the best PC shooter we can do. With our company our goal is to make it the best shooter of all time. Once we achieve that, our achievement is we do our best and that’s it. Whether we do it our not is to be determined. Once we are there, then we’ll take the next step. GI: Crytek is known to have made stunningly beautiful games, and while you can sort of experience them on lesser hardware, if you have the quad-SLI setup, and three gigs of RAM and a super fast processor it’s going to look incredible. With looking at what the Wii has under the hood, does that discourage you as a developer? Might want to give sources when you post stuff. I copied it from the IGN Wii boards and the article kept saying GI(Game Informer) so I copied the text and got the link to them. Next time I'll go deeper and link your site too if need be. Thanks for the heads up. Whether the Wii has the horsepower or not, that guy from Crytek does have a point that developers can achieve anything with any hardware. They just have to work at it. He has the right attitude for sure about the Wii and it can only mean good things to come from them. Guys like Mark Rein don't even want to try to make a game on the Wii because it seems they just don't want to do any work themselves and just let the most powerful system do it for them. Yeah It's too bad that cliffyb loves his ds and I think he could pull out some good games on the wii but I don't think the guys at epic are ready for the wii. They are treating all of the HD console like computer systems which could be a problem. Every thing they do seems to be jerky and jumpy... Maybe they should try 2d again and get there animation right? As for crytek doing wii games... Well bring it on man... The wii is money waiting to happen. The power of the channel system should not be ignored.